Calling the movement of crude oil by rail an “imminent hazard” to the public, the federal Department of Transportation said on Wednesday that railroads would be required to notify local emergency responders whenever oil shipments traveled through their states. The emergency order follows a spate of accidents that have raised concerns about the safety of the trains that carry increasing amounts of crude oil from the Bakken region of North Dakota across the United States. It said railroads with trains that carry more than one million gallons of Bakken crude, the equivalent of about 35 tank cars, must provide state emergency commissions with detailed information about their shipments within the 30 days of the emergency order. Typically, oil trains carry 100 cars or more. The requirement includes disclosing the number of trains each week, the specific routes the trains will travel and which counties they will cross. Until now, railroads were under no obligation to disclose any of that information and provided it only under strict conditions if it was requested. The announcements come a week after an oil train derailed in Lynchburg, Va., spilling 30,000 gallons into the James River, erupting into flames and forcing the evacuation of 350 people. 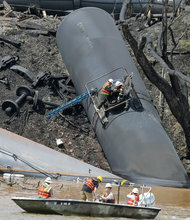 It was the latest in a series of accidents that have caught industry regulators as well as railroads off guard. Last year an oil train exploded in Lac-Mégantic, Quebec, killing 47 people. The announcement on Wednesday included regulators’ starkest language yet about the dangers of crude oil transport; the regulators have been accused by lawmakers and safety advocates of being slow-footed. The number of accidents, the order said, “is startling, and the quantity of petroleum crude oil spilled as a result of those accidents is voluminous” in comparison with past accidents. Last month, regulators in Canada said they would require emergency plans from the railroads on responding to catastrophic explosions and would quickly retire older models of tank cars commonly used to carry crude oil. Canada also took a decisive step to force shippers to use a stronger model of tank car within the next three years, effectively setting a new benchmark in the United States as well, given the amount of traffic between the two countries. The new model is based on a standard developed by the North American railroad industry in 2011. Communities around the United States have experienced a surge in oil traffic in the last five years thanks to a boom in domestic oil production, particularly from the Bakken Shale region. This Bakken oil, which accounts for almost all the crude oil in the United States that is transported by train, is more flammable than other types of crude oil, which typically travels by pipeline. The Bakken region produces about one million barrels of crude each day; about two-thirds of that is shipped by rail. Many states, including New York, Oregon and Minnesota, and cities like Seattle have urged railroads to provide more information about their shipments, something the industry has resisted so far, invoking protections from state oversight afforded by federal commerce rules. The railroad industry has traditionally been secretive about its routing of hazardous materials, citing security concerns. Earlier this year, railroads said they would treat oil as a hazardous material and agreed to speed limits, among other things, to increase safety. It required that railroads also assist state officials in disseminating any information they provide to emergency responders in the affected counties. Also, according to transportation officials, the shipping information provided by railroads would not be made public. It would instead be restricted to emergency personnel, something rail officials have long insisted on. But some elected officials remained skeptical about how the requirements would be put into effect. “The D.O.T. absolutely needs to further clarify to the oil and rail companies how to implement these steps, as I’m concerned that calls for action without clear guidelines won’t actually do much to improve safety,” Senator Heidi Heitkamp, Democrat of North Dakota, said in a statement. The Transportation Department is still working on updating standards for the old tank cars, known as DOT-111s, which have been in service since the 1960s. It recently sent its proposed new rules for review by the White House’s Office of Information and Regulatory Affairs and expects to make them public by the summer. Regulators are weighing the proper timeline for phasing in the new cars. A timeline that is too quick would curtail shipments from the Bakken region. There are more than 94,000 of those tank cars used to transport crude oil in Canada and the United States, according to the Railway Supply Institute, a trade group for rail car suppliers and owners. About 14,000 of them were built after 2011 based on a new industry standard, CPC-1232, that complies with the new Canadian rules. A total of 55,000 have been ordered through 2015, according to the group. But complicating matters, the Association of American Railroads, which helped set the new tank car standards in 2011, has since called for even tougher standards. The association, representing major freight carriers, said in November that the government should develop more-stringent regulations and aggressively phase out or refit old tank cars, including the CPC-1232. The association’s newest proposals include using thicker shells to strengthen the tank cars and equipping them with features to better withstand a crash. It is unclear whether those proposals are part of the government rules being considered. The delays over a federal standard have complicated matters for shippers and oil companies. Some companies, like Canada’s National Railway and Canadian Pacific, said they would charge higher rates for customers that move crude in rail cars built before October 2011. Others have taken voluntary steps. Global Partners, which operates a large rail yard in Albany, said last week that it would require oil trains arriving at its terminals to comply with the CPC-1232 design starting on June 1. The company has led the expansion of the Albany crude terminal, which supplies a large number of East Coast refineries.